All five films, though vastly different in story, structure and execution, share concurrent themes of people pushed to extremes when faced with societal injustices. Meanwhile four of the five are galvanized by commanding performances from females in lead roles, and three of those four depict mothers who will stop at nothing to protect their children. Kristen Scott Thomas is consoled after the Oscar snub and left wondering how many more languages she must speak on film before getting another nomination. 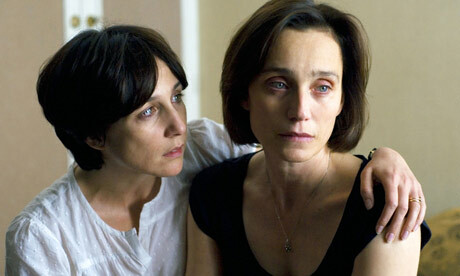 Il Y A Longtemps Que Je T’aime (I’ve Loved You so Long): Veteran British actress Kristen Scott Thomas does some time in France as a woman released from prison after fifteen years and must now reunite with her sister in this tasteful but piercing character study which takes its title from the lyrics of “A La Claire Fontaine”. The Good: the powerhouse performance from the ever versatile and interesting Kristen Scott Thomas, the thoughtful and literary-minded screenplay from writer/director Philippe Claudel, the subtle character development, the nuanced acting from the entire cast, the quiet revelations as we learn why she was in prison and why she did what she did. The Bad: as a first film the direction was a bit amateur, though thankfully the screenplay was anything but. The Bottom Line: starts slow but packs an emotional wallop…discerning film enthusiasts should queue this post haste. Angelina Jolie phones in her Oscar nomination to the Academy. Changeling: Clint Eastwood directs Angelina Jolie in this true story about a woman whose son goes missing in 1920’s Los Angeles and is given an imposter boy in return by the corrupt and bumbling police department. The Good: the meticulous attention to period detail, the acting, the shocking “true story” that grows more fascinating with each plot twist. The Bad: the glacial pacing, the emotional disconnect, the relentless darkness. The Bottom Line: queue it up…if you like this sort of thing. Frozen River: Melissa Leo (in an Oscar nominated role) plays a woman driven to extremes to make ends meet for her and her two sons after her deadbeat husband abandons them two weeks before Christmas in this stark, low budget feature film debut from indie writer/director Courtney Hunt. The Good: a truly unique story-line (and setting) that explores smuggling illegal immigrants through Mohawk Nation Territory straddling both sides of the U.S./Canadian border (and the titular body of water), Melissa Leo’s performance. The Bad: a first screenplay that was Oscar nominated but probably could’ve benefited from some more work-shopping, the strained credibility as the story progresses, the sometimes painfully amateur acting from the supporting cast. The Bottom Line: fans of indie dramas should lower expectations and then queue this up for Leo’s performance and the interesting story…just don’t expect to be blown away. 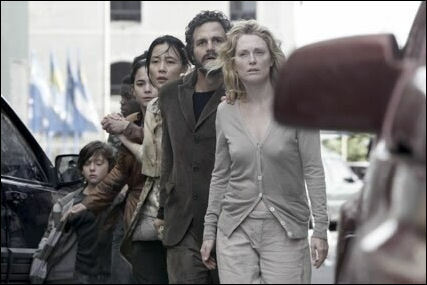 Julianne Moore checks the rearview mirror to see how many of those pesky blind people are following her. Blindness: Fernando Meirelles directs Julianne Moore as the only person who can see after a mysterious epidemic strikes the whole world blind in this adaptation of the novel by Jose Seramango. The Hollywood Math: [(Children of Men + Lord of the Flies) * (City of God – realism)]/WTF? The Good: Meirelles directorial flourishes giving the viewers a blind person’s POV, Julianne Moore’s performance, the powerful message at the end if you can make it that far. The Bad: the hyper-white lighting and cinematography, everyone else’s performance, the depravity depicted as society quickly descends into barbarism, the “in your face” symbolism, the disconnect with the characters who are never given names, the gigantic plot holes inherent in such a parable. The Bottom Line: queue it only if you like ambitiously allegorical films with unique visual styles that make you angry, leave you perplexed and are as fascinating for their monstrous failings as they are for their few genuinely compelling elements. The cast wonders if they stare down Spike Lee, will he come to his senses? Miracle at St. Anna: As a fan of both Spike Lee and WWII films, this was at one time my most anticipated film of the Fall 2008 movie season…until those reviews dive-bombed this joint and lay ruin to it like a Nazi blitzkrieg. 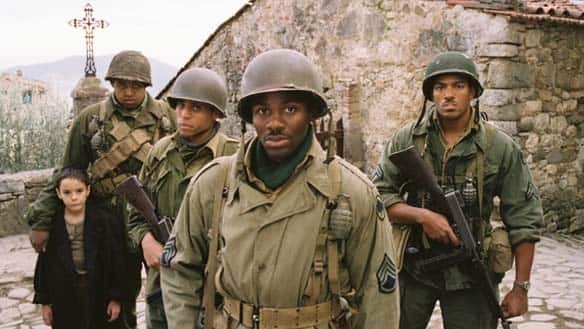 I must admit Lee wasted a great opportunity to present us an unflinching portrayal of the African American experience in WWII and instead adapted this overly convoluted and stereotype-ridden novel about a group of Buffalo Soldiers trapped in Tuscany during a German raid book-ended by a murder mystery surrounding a religious relic. The Good: the cinematography, the Tuscan scenery, Lee’s keen eye for the ladies, the subplot involving an Italian resistance fighter avoiding German capture and the ensuing massacre that ties up all the ridiculous loose ends of the plot. The Bad: the bloated and ill-managed screenplay, the opening thirty minutes, the crass attempts at comic relief, Lee’s intermittently lazy direction, the endless parade of stereotypes and cliches, the forced emotions, the oddly staged battle scenes which look and feel like they were done by a child “playing war” and going overboard rather than a skilled director creating a gritty re-enactment. The Bottom Line: queue it only if you are content seeing any Spike Lee Joint or insist on watching every film ever made that takes place during World War II. This entry was posted in Art-house Cinema, Book to Film Adaptations, Movie Reviews, Movies and tagged A La Claire Fontaine, Angelina Jolie, Blindness, Changeling, Clint Eastwood, Courtney Hunt, Fernando Meirelles, Frozen River, I've Loved You So Long, Il Y A Longtemps Que Je T'aime, Julianne Moore, Kristen Scott Thomas, Melissa Leo, Miracle at St. Anna, Movie Formula Math, Netflix Queue, Philippe Claudel, Spike Lee. I’ve been wanting to see ‘I’ve Loved You so Long’ for ages. Inexplicably, it’s release in France seems to have been either so minor as to be unnoticeable or it never came out. I live in Grenoble – hardly a backwater – and I’m almost certain it never made it here. Not sure what to make of late-period Eastwood. I admire the Hiro Jima dyptich but was not blown away. I don’t rate Million Dollar Baby or Mystic River at all – which probably puts me in a minority. For me Eastwood’s peak as director was Unforgiven by a long shot. The only film worth putting on the queue of that bunch is the one you are apparently the most excited by, and of course that’s the one with Kristen-Scott Thomas, which overcomes the ‘amateurishness’ you are concerned with to stand as an affecting and brilliantly-acted drama. Scott-Thomas was actually rooked out of a deserving Best Actress nomination, losing out to Angelina Jolie, which is rather ludicrous. Very nice post here, especially with the March glut of DVD releases of last year’s new films. Criterion has just announced they will be doing BENJAMIN BUTTON, which for most people will be a major surprise, but Criterion has had a long association with David fincher, having released both SEVEN and THE GAME in deluxe laserdisc box sets years ago………and THE READER will be out in a few weeks. That one deserves an outright purchased, but I have battled at many blogsites defending it. It was a top-ten finisher on my 2008 year-end list.